CREMATION- Mary Hickey was never dying to get into the growing industry surrounding cremation and other kinds of après death disposal. Indeed her current job as a purveyor of silk-covered urns was as improbable as death is certain. As a three-year old, she freaked out at her grandfather’s funeral – an experience that prompted her to avoid memorial services and funerals through most of her life. And only two years ago, Hickey was a marketing executive at a high-tech high-flyer near San Francisco. But Hickey knew a business opportunity when she saw one. 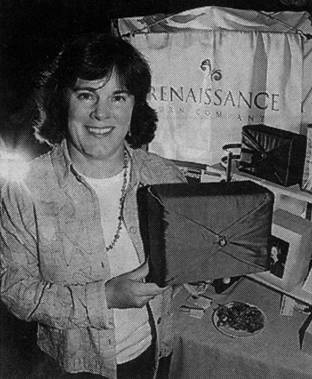 She left her job at Cisco to become co-founder of Renaissance Urn Company, which markets plastic containers covered in silk, a fashionable accessory for a beloved one’s remains. This week she is one of more than 60 product distributors at a trade show being held by the Cremation Association of North America at the Fairmont Hotel in Vancouver. Hickey’s jump into the after-life business began in 2002 when she met Bob Wheeler, another Bay Area high-tech executive, who had made a Raku-style pot for his own mother’s ashes. The funeral director involved was so impressed with the home-made urn that he urged Wheeler to make more for sale. Wheeler, still happy with his job, demurred. “But it occurred to him that if they are interested in something he made himself, they must be desperate,” Hickey said. “So it gave him the idea”. She and Wheeler did some market research and found out that the cremation business had come to life in North America over the past decade. Still, the product-industry around cremation was relatively young. “And we thought why not get into a business that a lot of people aren’t clamoring to jump into. Some people don’t mind being in the death business but others think it’s kind of weird, kind of creepy. Renaissance is now selling more than 300 $80 silk-covered urns a month to funeral homes. The new firm also markets inexpensive urn covers made out of heavy, handmade paper. The company’s market niche was given a boost by the post-9/11 security concerns concerning air travel. In April, the Transportation Security Administration began advising funeral homes that customers traveling by plane with cremains must use an urn that can be x-rayed if they want to take it as a carry-on item. This means that many conventional urns, including those made of metal or lead-lined ceramic, wouldn’t be suitable for air travel because they are opaque to X-ray equipment, and would have to be placed as checked luggage, destined for the baggage-claim carousel. “People don’t like to put Mom through the carousel with all the other baggage because they are afraid she will get lost and end up in Lord knows where,” Hickey said. This federal ruling led to an increase in sales of silk-covered urns marketed by Hickey’s firm. The cremation industry is trying to provide ways to bridge cremation with memoralization. “The challenge is letting people know about options. Most cremated remains are still taken home.” Families may opt to scatter Dad’s cremains at his favorite fishing hole, said Springer, but also place some cremains in a permanent niche in a cemetery, which provide a place where his children can seek emotional solace in their grieving. They may also opt to place some cremains in a teddy bear-at least that was one product exhibited at the cremation trade show in Vancouver. The BarelyGone bear has a concealed, zippered satin pouch that can hold cremated remains.